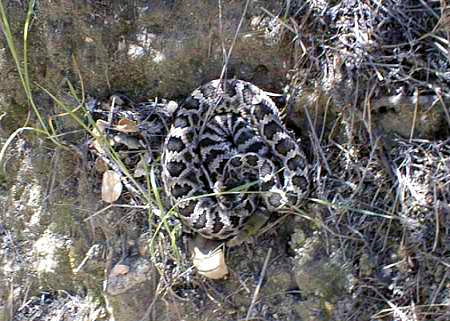 This is the only dangerously venomous snake in coastal Los Angeles County. Ranging in color from pale gray to dark brown and black, it has somewhat diamond-shaped blotches down the back, each outlined in lighter scales. It is easily identified by the presence of rattles on a blunt tail, and by the broad head with a narrow neck, creating a trianglular shape. Bright and colorful in its new "coat", this rattler was on the defensive when these photos were taken. The yellowish rattle at the bottom right of the body was shaking violently in a warning to stay away.